Education Minister Gordon Dirks and Premier Jim Prentice during the by-election campaign. Disgraced former premier Alison Redford gave Albertans a convincing reason to vote Wildrose, but Danielle Smith‘s official opposition needs to find a new strategy to defeat Premier Jim Prentice‘s Progressive Conservative. This appears to be the case as Alberta’s Progressive Conservatives celebrate their candidates victories in four Alberta by-elections held yesterday. The wins in the four strong-PC voting constituencies are a signal that the long-governing party should not be underestimated. And despite two years of spending scandals, embarrassment and misdeeds, the PC Party remains a competitive political force in this province. It appears that despite the scandals, many Albertans wan to give Mr. Prentice a chance. And the PC’s smooth ‘be boring‘ and ‘de-Redfordization‘ strategy appears to have paid off with voters, at least in the short-term, and helped the party hold onto Calgary-Elbow, Calgary-Foothills, Calgary-West and Edmonton-Whitemud. Chosen as PC Party leader in September 2014, Mr. Prentice was personally elected last night in Calgary-Foothills, with a commanding lead ahead of Wildrose candidate Kathy Macdonald. In Calgary-West, a constituency the Wildrose had targeted to win, candidate Sheila Taylor was narrowly defeated by Tory Mike Ellis. The Wildrose hoped that Ms. Taylor’s high-profile role as a public school board trustee would take her to victory, but the PCs Mr. Ellis narrowly held on to the constituency first won by former premier Peter Lougheed in 1967. The by-elections gave Ms. Smith’s Wildrose Party an opportunity to test campaign tactics, strategies and messages in preparation for the next election, and it is obvious they fell flat. While PC Party supporters on social media have vocally called on their opponent to step down, the Wildrose would be foolish to part with the leader, who is one of their greatest assets. Ms. Smith is media savvy and has grown into her role as Premier-in-Waiting. Despite missing an opportunity to steal a by-election away from the PCs, the Wildrose is still strong in other areas of Alberta (and in other constituencies in Calgary and Edmonton). One recent poll shared with this blogger showed the Wildrose with 51% support in rural Alberta and 47% in the province’s small cities, which represent a significant number of constituencies in Alberta. Despite tonight’s losses, the 2016 election could still be hotly contested between the two conservative parties. But worrying to both the Wildrose and the PCs should be the other opposition parties that made significant electoral gains in these by-elections. 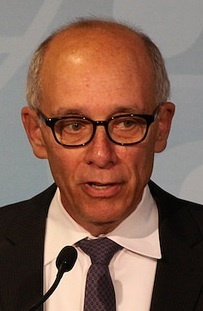 In Edmonton-Whitemud, PC Health Minister Stephen Mandel saw his party’s vote drop by nearly 20% from the 2012 election, but still collected enough votes to defeat New Democrat Dr. Bob Turner. 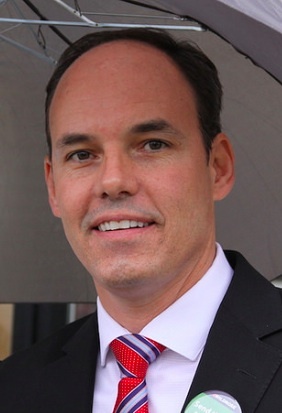 Wildrose candidate Tim Grover was relegated to third place. Dr. Turner’s 21% finish marks the first time the NDP has placed second in this constituency since the 1986 election, an impressive feat for the tiny Edmonton-based party. 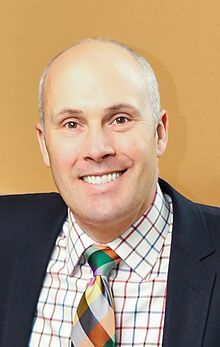 And in Calgary-Elbow, Alberta Party leader Greg Clark exceeded expectations, placing a close second behind PC Education Minister Gordon Dirks. Mr. Dirks’ was elected with the help of a convenient opposition vote-split between Mr. Clark and talented Liberal Susan Wright. But despite the narrow defeat, this second place finish gives Mr. Clark a solid foundation to run as a candidate in the next election. Before the next election, can any of those tiny opposition parties garner enough strength on their own to take advantage of a split within Alberta’s conservative movement? And as Wildrose strategists analyze the results of yesterdays vote, can they come up with a plan to defeat the Tories? In spite of yesterday’s wins by the 43-year governing PC Party, will Albertans still be willing to give Mr. Prentice a chance in 2016? One this is for sure, the political landscape in Alberta looks more interesting than ever. This entry was posted in Alberta Politics and tagged Alison Redford, Bob Turner, Calgary-Elbow by-election, Calgary-Foothills by-election, Calgary-West by-election, Danielle Smith, De-Redfordization, Edmonton-Whitemud by-election, Gordon Dirks, Greg Clark, Jim Prentice, Mike Ellis, Peter Lougheed, Sheila Taylor, Stephen Mandel, Susan Wright, Tim Grover on October 28, 2014 by Dave Cournoyer. Will by-election losses teach Alberta’s progressive parties basic math? 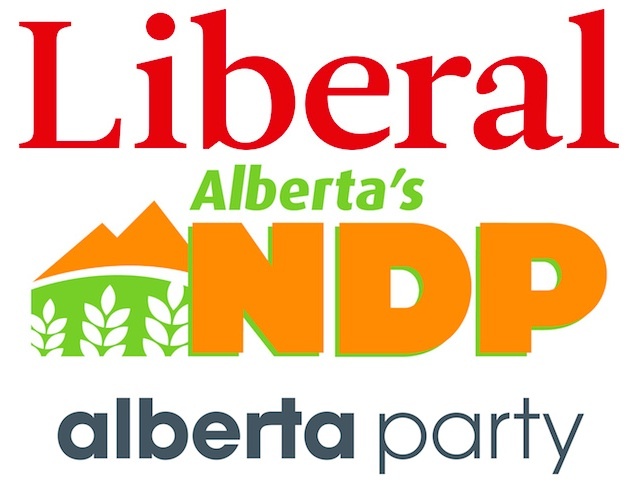 Alberta’s non-conservative opposition is represented by the Liberal Party, the New Democratic Party and the Alberta Party. Fast forward to 10:00 p.m. on October 27, 2014. The ballots have been counted in Alberta’s four provincial by-elections and the two main conservative parties – the governing Progressive Conservatives and official opposition Wildrose Party – have taken the largest share of the votes. Once again the handful of “progressive” opposition political parties were left sitting on the sidelines when the ballots were counted. It is an easy scenario to imagine. As voters head to the polls in the Calgary-Elbow, Calgary-Foothills, Calgary-West and Edmonton-Whitemud by-elections today, it appears that the Alberta Party, New Democratic Party and Liberal Party will largely be relegated to third, fourth or fifth place in most races. While I recognize the argument against vote splitting is not perfect, it has created a convenient “divide and conquer” situation for the PC Party for decades. But with the conservative vote is now split between the PCs and Wildrose, none of the progressive parties on their own appear strong enough to take advantage of this division. In Calgary-Elbow, the constituency formerly represented by Alison Redford, a progressive candidate should have a shot of winning. The Liberals won Elbow in a 2007 by-election when they were the main opposition to the PCs and held onto it until 2008. But seven years later, the progressive opposition is represented by two excellent candidates in Alberta Party leader Greg Clark and Liberal Susan Wright. Both who are likely to draw votes away from each other, allowing Education Minister Gordon Dirks to win. In Edmonton-Whitemud, a traditionally strong PC voting constituency, the NDP and Liberals have both put forward strong candidates in Dr. Bob Turner and Dr. Donna Wilson. While it is unlikely that either candidate would defeat PC candidate and former mayor Stephen Mandel on their own, the presence of the two progressive candidates on the ballot further divides the opposition. On Saturday evening, the Liberal Party published a press release claiming an Alberta Party supporter tried to broker some sort of deal with the Liberal candidate in Calgary-Elbow. The Liberal claims are flimsy and it is unclear what sort of electoral deal could be arranged in the few days before an election (it would be too late to remove a candidate’s name from a paper ballot). The four by-elections are being held in urban constituencies where the PC Party has enjoyed strong support for decades. And the argument could be made that there are a handful of constituencies in Alberta where the non-conservative opposition parties would be more competitive in a by-election. But in the end, it comes down to basic math. As a provincial politician committed to many of the same progressive principles as the three above-noted candidates, what did I learn from this? Well, I think I’ve learned basic math. The center/center-left in this province will not form government until we are in one big tent party. At this moment in time, and objectively looking at the provincial platforms of the progressive parties, we are for all intents and purposes also a distinction without a difference. In the last election the NDP, Liberals, Greens and Alberta Party agreed on policy 95% of the time. We should all be together in one big tent; there is less difference between all of our political parties than there is between the different wings of the PC government. What keeps us apart is rugged tribalism that leads to infighting between us and keeps our guns pointed squarely at each other instead of focusing our fire on the right-wing in this province. We tend to identify with our brands and not necessarily the values that we share. Let me be the first to say, I’m putting down my gun, and am open to all conversations with no preconditions. We need to figure out how we can come together in a big tent party. Otherwise, we are wasting our time. It’s math. This entry was posted in Alberta Politics and tagged Alison Redford, Bob Turner, Calgary-Buffalo, Calgary-Elbow by-election, Calgary-Foothills by-election, Calgary-West by-election, Donna Wilson, Edmonton-Whitemud by-election, Gordon Dirks, Greg Clark, Kent Hehr, Stephen Mandel, Strategic Voting, Susan Wright, Unite the Left on October 27, 2014 by Dave Cournoyer. What’s at stake in the four Oct. 27 by-elections? With less than two days left in Alberta’s mini-election, voters will head to the polls on the morning of October 27, 2014 to cast their ballots in by-elections being held in Calgary-Elbow, Calgary-Foothills, Calgary-West and Edmonton-Whitemud. As these mid-term elections approach, what is at stake for Alberta’s political parties? In a normal general election, the PC Party would easily elect candidates in all four of these constituencies, as they did in the 2012 election. In three of the by-elections, the PC Party benefits from having three high-profile candidates – Premier Jim Prentice in Calgary-Foothills and appointed Health Minister Stephen Mandel in Edmonton-Whitemud and Education Minister Gordon Dirks in Calgary-Elbow. Not wanting to expose themselves to criticism, the PC candidates have faced criticism for skipping all-candidates forums in their constituencies. But despite shying away from debating their opponents, the PC Party has not shied away from using the leavers of government power to keep their candidates front and centre in the news during the by-election campaigns. My general impression is that many Albertans want to give Mr. Prentice a chance as Premier, despite their disapproval of his recent predecessor, Alison Redford. PC victories in all four by-elections would not come as a surprise, but a loss in one or more would be a warning sign to the PC Party. A personal loss for Mr. Prentice or one of his cabinet ministers would be a significant blow to the 43-year long governing PC Party. From the beginning of the by-election campaign, Wildrose leader Danielle Smith has been managing expectations and downplaying her party’s chances of winning in these strong-PC voting constituencies. But that does not mean the Wildrose should be underestimated, because they are in it to win. The official opposition party has released a series of television and radios ads during the by-elections praising their leader and attacking Mr. Prentice as being “the same” as Ms. Redford. The Wildrose has focused on areas where the Tories are perceived as being weak – trust and fiscal responsibility – and hope that the memory of Ms. Redford has not faded in the minds of Albertans. As the official opposition, the Wildrose needs to win at least one of the four by-elections to show it still has the strength to compete with the Tories in the next election. The Wildrose likely has its best shot in Calgary-West, where public school trustee Sheila Taylor is running against PC candidate Mike Ellis, a Calgary police officer. The Wildrose are running former police officer Kathy Macdonald against Mr. Prentice in Calgary-Foothills and John Fletcher in Calgary-Elbow, where Ms. Redford is the former MLA. Despite historical PC strength in the four constituencies, four losses by the Wildrose could force Ms. Smith to have to defend her leadership going into the party’s annual meeting later this year. 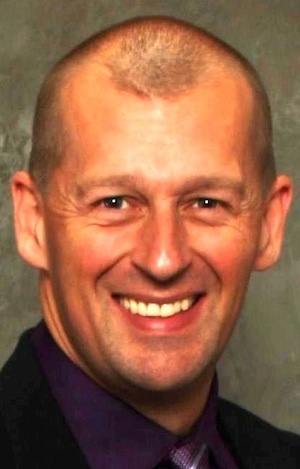 Also running for the Wildrose is Tim Grover in Edmonton-Whitemud. An NDP pamphlet used in the Edmonton-Whitemud by-election. 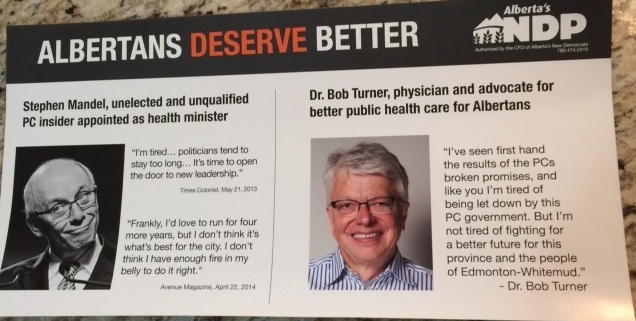 Not really a contender in the three Calgary by-elections, the Alberta NDP has focused their resources in Edmonton-Whitemud where Dr. Bob Turner has run an aggressive campaign against Health Minister Mandel, attacking him for his lack of knowledge of the health care system. Dr. Turner, or “Dr. 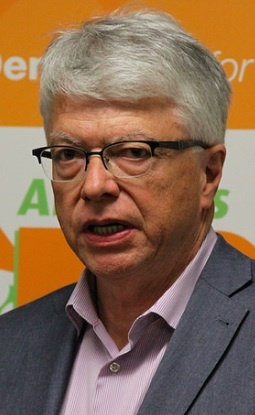 Bob” as he is affectionately known as by NDP supporters, has punched above his party’s weight in this by-election by dominating media coverage of the Whitemud by-election. While the NDP have risen in the polls in Edmonton, Whitemud is not a traditional NDP voting area. The NDP earned 9% in Whitemud in the last election and last placed second in the riding in the 1986 election. A win in Whitemud would be a spectacular victory for the NDP, but a strong second or third place showing is more likely. If the NDP places ahead of the former official opposition Liberals, it will strengthen the party’s argument that the Rachel Notley-led party is now the official progressive opposition to the PCs and Wildrose in Edmonton. Also running for the NDP are Stephanie McLean in Calgary-Elbow, Jennifer Burgess in Calgary-Foothills, and Brian Malkinson in Calgary-West. 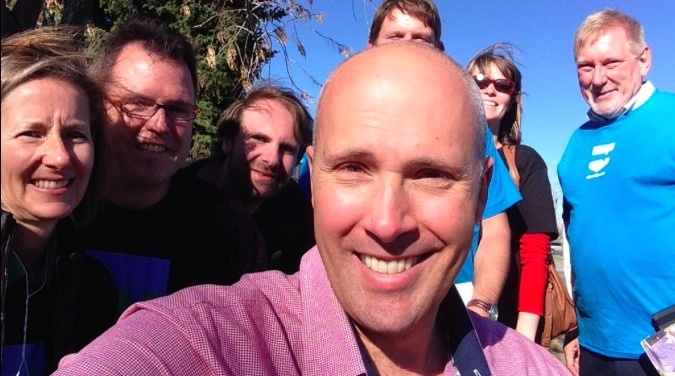 A Greg Clark self with his supporters on the campaign trail in Calgary-Elbow. With no seats in the Assembly, the stakes are low for the Alberta Party. With leader Greg Clark as their candidate, Calgary-Elbow has been a fertile sandbox for the Alberta Party to focus on and try out new strategies. Focusing on hot-button locals issues like local school closures and flood mitigation, Mr. Clark’s campaign appears to have spooked the PC Party, who are hoping Mr. Dirks’ candidacy will mitigate any lingering embarrassment voters feel from Ms. Redford’s time as the local MLA. Mr. Clark has earned the endorsements of popular Mayor Naheed Nenshi‘s chief of staff Chima Nkemdirim, former Green Party candidate Chris Turner, former city councillor Gael Macleod and former mayoral candidate Wayne Stewart. A win for Mr. Clark would be a huge victory for the Alberta Party and add a twist to the dominant PC-Wildrose narratives that has dominated Alberta politics since before the last election. Mr. Clark is the son of Gilbert Clark, a Liberal candidate who came within 900 votes of defeating rookie PC candidate Ralph Klein in 1989. Also running for the Alberta Party are William Munsey in Edmonton-Whitemud, Michelle Glavine in Calgary-Foothills, Troy Millington in Calgary-West. Liberal Susan Wright and her campaign supporters. Despite having solid candidates in Calgary-Elbow (Susan Wright) and Edmonton-Whitemud (Donna Wilson), expectations are not high for the Liberal Party in these four by-elections. The Liberals have raised questions about Mr. Mandel’s connections to tobacco industry lobbyists and focused on health care issues in the Edmonton-Whitemud by-election. But it is difficult to tell if the party has gained much traction in these by-elections. Unlike its popular federal cousins, the provincial Liberal Party has become a sort of political sideshow, continuing to suffer a slow decline since losing official opposition status in the last election. These by-elections will determine whether Dr. Raj Sherman’s Liberals are still a relevant force in Alberta politics. 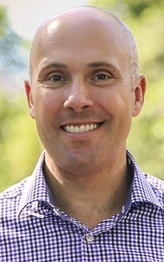 Also running for he Liberals are David Khan in Calgary-West and Robert Prcic in Calgary-Foothills. The Green Party of Alberta has put forward candidates in two of the four by-elections. Polly Knowlton Cockett in Calgary-Foothills and Rene Malenfant in Edmonton-Whitemud. The Green Party holds no seats in the Assembly and, while they have good intentions, it is unlikely that they will be competitive in the Oct. 27, 2014 votes. Eligible voters living in these four constituencies can vote in the by-election on Oct. 27, 2014 between the hours of 9:00 a.m. and 8:00 p.m. Visit the Elections Alberta website to find your voting station. This entry was posted in Alberta Politics and tagged Alberta By-Election, Alison Redford, Bob Turner, Calgary-Elbow by-election, Calgary-Foothills by-elections, Calgary-West by-election, Chima Nkemdirim, Chris Turner, Danielle Smith, David Khan, Donna Wilson, Edmonton-Whitemud by-election, Gael McLeod, Gilbert Clark, Gordon Dirks, Greg Clark, Jim Prentice, John Fletcher, Kathy Macdonald, Michelle Glavine, Naheed Nenshi, Polly Knowlton Cockett, Rachel Notley, Raj Sherman, Ralph Klein, Rene Malenfant, Robert Prcic, Stephen Mandel, Susan Wright, Tim Grover, Troy Millington, Wayne Stewart, William Munsey on October 25, 2014 by Dave Cournoyer. Can the opposition win any of the 4 by-elections? The Liberals celebrate a victory in the 2007 Calgary-Elbow by-election. Left to Right: MLA David Swann, victorious candidate Craig Cheffins, Liberal leader Kevin Taft, MLA Dave Taylor and MLA Harry Chase. Can the opposition parties win any of the four provincial by-elections being held on October 27, 2014? The by-election votes will take place in four urban constituencies that were considered safe for the Progressive Conservatives in the 2012 election. With a change in provincial leadership and a volatile political environment, these by-elections do provide opportunities for the opposition parties to make gains. In Calgary-Elbow, Wildrose candidate John Fletcher appears to be PC candidate and appointed Education Minister Gordon Dirks‘ main conservative challenger and challenges from two other liberal-leaning candidates could create an interesting result in Calgary-Elbow. Liberal Susan Wright and Alberta Party leader Greg Clark are running strong campaigns competing for the same liberal and moderate voters that Mr. Dirks will need to win against his more conservative opponent. Mr. Clark has gained the support of 2012 PC Party campaign strategist Stephen Carter and 2012 Liberal Party campaign manager Corey Hogan, who are both heavily involved in his campaign. 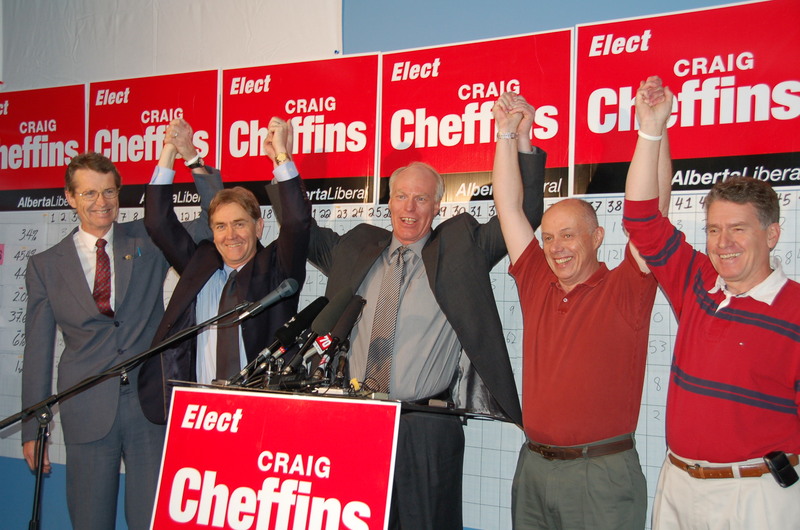 Liberal MLA Craig Cheffins was able to win this constituency in a 2007 by-election at a time when the Liberals were Official Opposition and the Tories were led by new PC leader Ed Stelmach, who was unfamiliar to most Calgary voters at the time. In 2014, the field of candidates and parties is much more crowded and unpredictable. Retired popular Edmonton Mayor and newly appointed Health Minister Stephen Mandel is widely expected to glide to victory in the Edmonton-Whitemud by-election (his predecessor, Dave Hancock was re-elected with 60% of the vote in 2012). Mr. Mandel’s vocal opponents are trying to make health care and the provincial government’s lack of long-term infrastructure planning the big issues of the by-election campaign. New Democrat Dr. Bob Turner has come out swinging with an aggressive campaign against the new Health Minister and his comments about “bed blockers” in the health care system. Both Dr. Turner and Liberal candidate Dr. Donna Wilson have made south west Edmonton’s aging and overcrowded Misericordia Hospital a focus of their campaigns. Dr. Wilson held a press conference outside the Misericordia Hospital yesterday and today the NDP will hold a lunch-hour rally outside the facility. Wildrose leader Danielle Smith chose the campaign office of Whitemud candidate Tim Grover to announce her party’s health care funding plan, including promises of $100 million to front-line care, $50 million to home care and $50 million to reopen long-term care beds. The Wildrose Party also released a series of election campaign-style online videos attacking the PCs. Statistician Eric Grenier predicts Wildrose candidate Sheila Taylor could win the Calgary-West by-election. Ms. Taylor, a now former trustee on the Calgary Board of Education, is a star candidate for the Wildrose in Calgary. She is facing Calgary police officer Mike Ellis, who unsuccessfully ran for the PC nomination before the 2012 election. Premier Jim Prentice‘s recent announcement to build an additional 55 new schools and renovate another 20 is certainly meant to boost Mr. Dirks’ and weaken Ms. Taylor’s candidacy. Quick to respond, Mr. Clark’s campaign set up a website detailing the schools Mr. Dirks voted to close during his time on the Calgary Board of Education. Running as a candidate in the Calgary-Foothills by-election, Mr. Prentice faces his main challenge from Wildrose candidate Kathy Macdonald, a 20-year veteran of the Calgary Police Service. Foothills has voted solidly PC since 1967 and while it is easy to assume that Mr. Prentice’s job as Premier makes him a shoe-in, he should not take voters for granted. Mr. Grenier has classified Foothills are a “tossup” between the PCs and Wildrose. There is nothing more the opposition parties would love than to see a sitting Premier defeated in his own constituency. A loss in Foothills might be unlikely, but a loss of even one of the four by-elections would be a sign that the PCs, even under “new management,” remain politically vulnerable. By-elections can be risky for incumbent governments, especially when voters are eager to use their votes to send a message. Calgary-Foothills all-candidates forum: October 15, 8:30pm at the Edgemont Community Association (33 Edgevalley Circle NW). Edmonton-Whitemud all-candidates forum: October 20 at 7:30 p.m. at Snow Valley Chalet. Hosted by the College of Physicians & Surgeons of Alberta and the College and Association of Registered Nurses of Alberta. Edmonton-Whitemud all-candidates forum: October 22 from 7:00 p.m. to 9:00 p.m. at the Riverbend United Church (14907 – 45 Avenue NW). This forum is hosted by Whitemud Citizens for Public Health. This entry was posted in Alberta Politics and tagged bed blockers, Bob Turner, Calgary-Elbow by-election, Calgary-Foothills by-election, Calgary-West by-election, Corey Hogan, Craig Cheffins, Danielle Smith, Donna Wilson, Edmonton-Whitemud by-election, Eric Grenier, Gordon Dirks, Greg Clark, Jim Prentice, Kathy Macdonald, Mike Ellis, Misericordia Hospital, Sheila Taylor, Stephen Carter, Stephen Mandel, Susan Wright, Tim Grover, Whitemud Citizens for Public Health on October 9, 2014 by Dave Cournoyer. 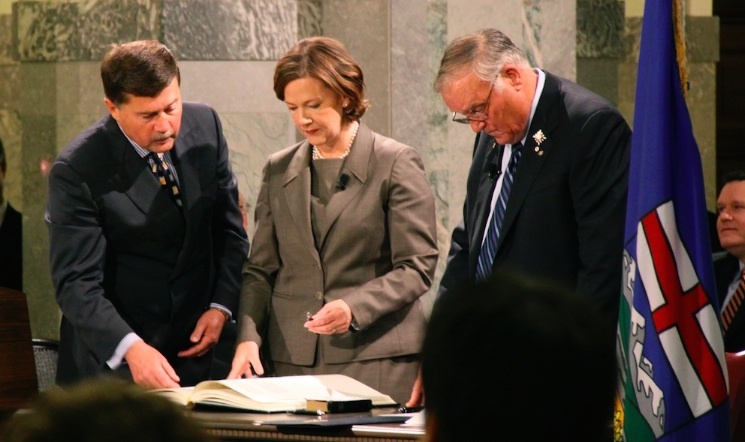 Alison Redford is sworn-in as Premier of Alberta on October 7, 2011. Lt. Governor Donald Ethell stands to the right. On October 7, 2011, Alison Merrilla Redford stood in front of a large crowd of her peers and power-brokers in the Legislature Rotunda as she was sworn-in as Alberta’s 14th Premier. 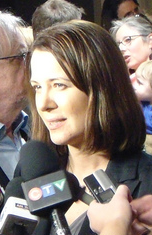 Having won the October 1, 2011 Progressive Conservative leadership contest with 37,101 votes to 35,491 for second-place Gary Mar, Ms. Redford became Alberta’s first woman Premier and fifth consecutive PC Party Premier. 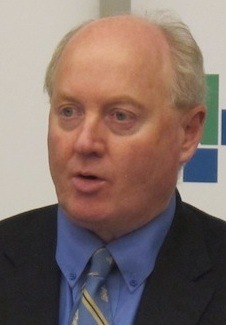 Leadership candidate Doug Horner, who would serve as her Finance Minister, played a large role in directing his supporters to vote for Ms. Redford on the final ballot vote. There is little doubt that October 7, 2011 was a proud day for Alberta and one that, for many Albertans, represented hope for positive change in our province’s politics. We were told to expect immediate action on critical and a new style of government from the long-governing PC Party. 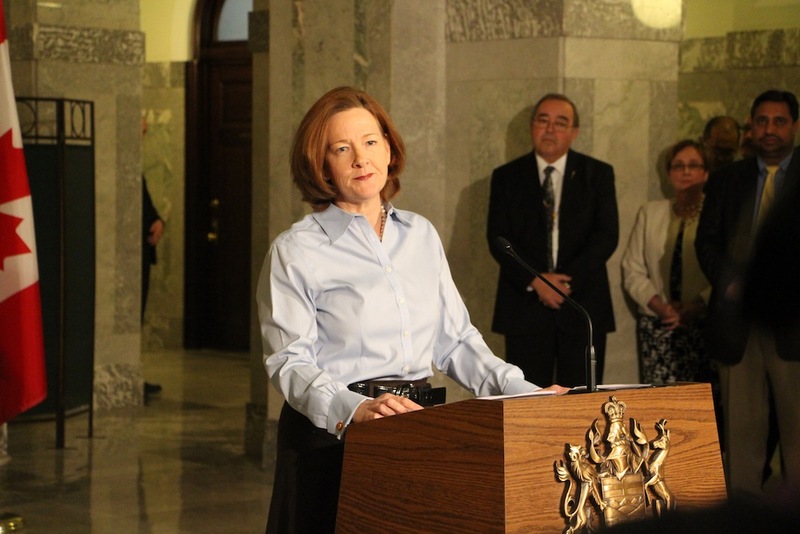 Alison Redford resigned as Premier of Alberta on March 23, 2014. What a difference 2 years and 167 days can make. Amid scandal, broken promises and a caucus revolt, Ms. Redford resigned as Premier and leader of the PC Party on March 23, 2014 and as the MLA for Calgary-Elbow on August 6, 2014. She was replaced by Deputy Premier Dave Hancock, who served until Jim Prentice was selected as PC Party leader on September 6, 2014. In more recent news, the Liberal Party announced its candidates in two Alberta by-elections. Robert Prcic will be that party’s candidate in the Calgary-Foothills by-election and David Khan in the Calgary-West by-election. Mr. Prcic was his party’s 2012 election candidate in Calgary-North West, where he earned 6% of the total vote. A recent email from the Liberal Party revealed the party was prioritizing their resources behind candidates in two other by-elections – Susan Wright in Calgary-Elbow and Donna Wilson in Edmonton-Whitemud. For more, see the full list of candidates in the by-elections and nominated to run in the next Alberta General Election. This entry was posted in Alberta Politics and tagged 2011 Alberta Progressive Conservative leadership race, Alison Redford, Calgary-Elbow by-election, Calgary-Foothills by-election, Calgary-North West, Calgary-West by-election, Dave Hancock, David Khan, Donald Ethell, Donna Wilson, Doug Horner, Edmonton-Whitemud by-election, First Woman Premier, Gary Mar, Jim Prentice, Premier of Alberta, Robert Prcic, Susan Wright, Today in Alberta History on October 7, 2014 by Dave Cournoyer. The magic of Tory reinvention. 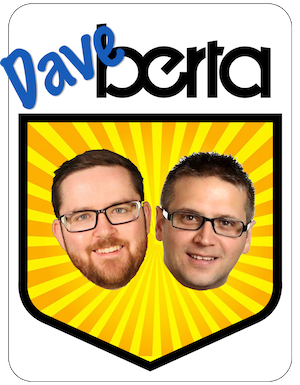 A new era for Alberta. 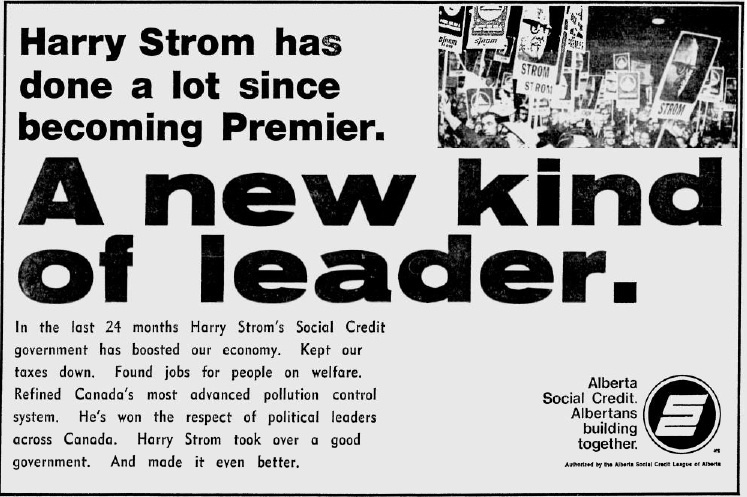 “A new kind of leader,” an advertisement from the Social Credit Party published in the Calgary Herald in 1971. As the Progressive Conservatives brandish their new slogan, “A new era for Alberta,” many Albertans might be confused about which political party has been in power for the past 43 years. If we were to apply the geological time scale of the Earth to Alberta politics, we would now find ourselves in the Honeymoon Period of the Prentice Era of the Progressive Conservative Eon (I will resist the temptation to name any political dinosaurs). A PC Party election ad used during the 2012 election. And despite the PC Party Eon having stretched more than four decades, PC Party candidates in four Alberta by-elections being held on October 27 are not running on their party’s record as the government since 1971. They are running on their party’s record since Jim Prentice became leader of the PC Party on September 6, 2014. And it is too early to tell whether Mr. Prentice will oversee “a long and distinct period.” His two most recent predecessors each lasted less than five years in office. 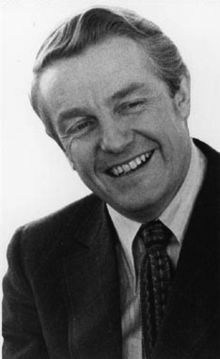 The PC Party’s “new era” slogan is somewhat reminiscent of another slogan used by Harry Strom‘s Social Credit Party as the 36 year old governing party tried, albeit unsuccessfully, to win re-election in 1971. But, unlike the Socreds in the 1970s, the PC Party has become masterful at reinvention, consistently rebranding their party since Peter Lougheed retired in 1984. Unlike Mr. Strom, who was overshadowed by his popular and larger than life predecessor, Ernest Manning, Mr. Prentice would never be caught in public uttering the words “Alison” or “Redford.” But while the PC Party tries to put their recently departed leader’s legacy behind them, the opposition parties and candidates will eagerly remind voters about the past two years of PC government. Just two years ago, the PC Party led by Alison Redford were re-elected in a hotly contested campaign under the slogan “Real life leadership” (see the campaign advertisement above). This slogan was a reference to both Ms. Redford’s time spent overseas as a United Nations lawyer and provided contrast with her predecessor, Ed Stelmach, and the perceived inexperience of Wildrose leader Danielle Smith. 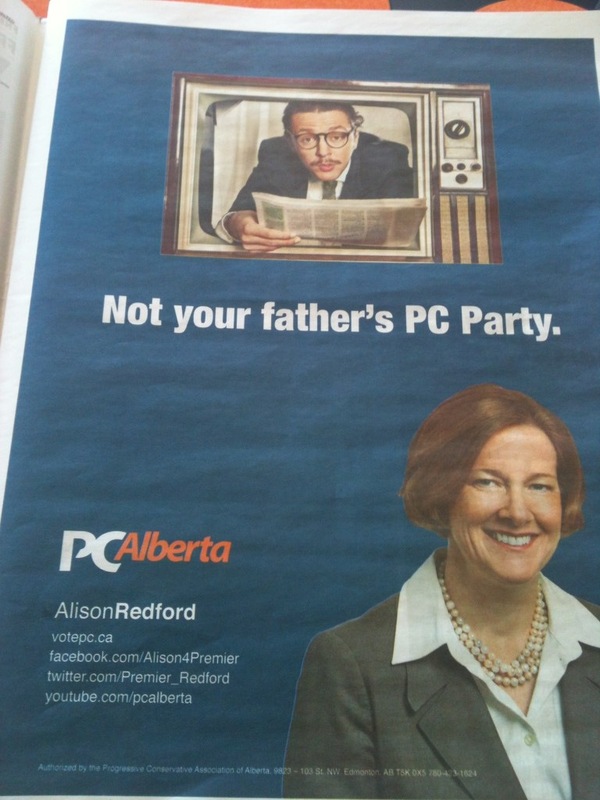 During the 2012 election campaign, a controversial advertisement published in some urban newspapers featured the slogan “Not your father’s PC Party,” which suggested to younger and more liberal-minded Albertans that the PC Party had entered a new era (and again provided a contrast to the perceived social conservative values of the Wildrose Party). Six years ago, borrowing from the success of Barack Obama‘s “Change we can believe in” slogan, the PC Party led by Mr. Stelmach chose “Change that works for Albertans” as their slogan in the 2008 election. 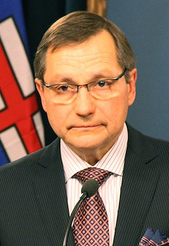 The slogan suggested that Mr. Stelmach’s main opposition, the Liberals, would provide change that would not work for Albertans. Like his successors, the PC Party under Mr. Stelmach worked hard to distance itself from the legacy of his predecessor, Ralph Klein. In the four by-elections being held at the end of October 2014, the opposition parties are also using new slogans to help brand their campaigns. “Send the PCs a message” is a slogan being used by the Wildrose Party, and it is meant to remind Albertans that by-elections are an opportunity to show dissatisfaction with the PC Party’s past two years of scandal and misdeeds. The NDP are using the slogan “Albertans deserve better,” which is a true statement, but it seems unlikely that most Albertans outside Edmonton city limits are about to look to the NDP as a better choice. While slogans alone will not win or lose an election campaign, they can cleverly help define the narrative each party or candidate is advancing and can serve as a rallying cry for or against voters choosing change at the ballot box. If you have a few moments after reading this post, I encourage you to take a glance at the extensive ‘List of Political Slogans‘ page on Wikipedia. This entry was posted in Alberta Politics and tagged A new era for Alberta, Alison Redford, Barack Obama, Calgary-Elbow by-election, Calgary-Foothills by-election, Calgary-West by-election, Change that works for Albertans, Change we can believe in, Changing with Albertans, Danielle Smith, Ed Stelmach, Edmonton-Whitemud by-election, Geological Time Scale, Harry Strom, Jim Prentice, Not your father's PC Party, Peter Lougheed, Ralph Klein, Real life leadership, Social Credit Party on October 6, 2014 by Dave Cournoyer. Provincial Health Ministers met at the Fairmont Banff Springs Hotel this week. BANFF – Stepping onto the national stage for the first time since he was appointed as Alberta’s Minister of Health, Stephen Mandel met with his provincial and federal counterparts this week in Banff for the annual Health Ministers meeting. Mr. Mandel co-chaired the meeting, a role his predecessor, Fred Horne, had planned to fill. The ministers are said to have discussed a wide-range of topics, perhaps most dramatically, a strategy for pharmacare, a plan that could decrease the cost of prescription drugs by billions of dollars each year. This sort of national plan would require the involvement of a federal Conservative Government that has, unfortunately for Canadians, taken a hands-off approach to health care. Mr. Mandel began on the long road of rebuilding relationships with federal government by meeting with federal Health Minister Rona Ambrose. Despite being represented by federal Conservative MPs in Ottawa, relations between the City and federal government soured in recent years. In November 2010, an angry Mr. Mandel publicly blamed Ms. Ambrose for the failure of the City’s unarticulated plans to host Expo 2017. 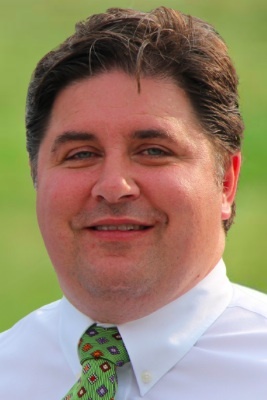 CALGARY – The Wildrose Party announced two of its by-election candidates this week. 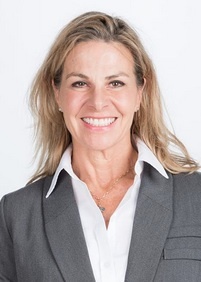 Former Calgary police officer Kathy Macdonald is running against Jim Prentice in Calgary-Foothills and Calgary public school board trustee Sheila Taylor will run in Calgary-West. A savvy move, Mr. Prentice announced the appointment of Emma May as the executive director of the Premier’s Southern Alberta Office at the McDougall Centre. A well-respected community advocate, Ms. May leads the Calgary River Communities Action Group, which represents residents whose homes were damaged by the 2013 floods. Ms. May’s appointment may also have an impact on the by-election in Calgary-Elbow, a constituency which includes many flood impacted neighbourhoods. Running as the PC candidate, appointed Education Minister Gordon Dirks is facing strong challengers in Wildrose candidates John Fletcher, Alberta Party leader Greg Clark and Liberal Susan Wright. 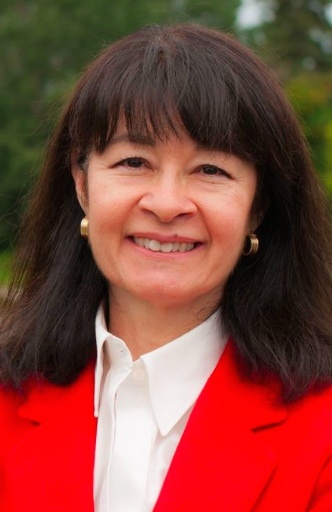 EDMONTON – Donna Wilson will run as the Liberal Party candidate in the Edmonton-Whitemud by-election. Dr. Wilson is a well-respected Professor of Nursing at the University of Alberta and the former President of the U of A Academic Staff Association. The Green Party is expected to announce its candidate in Edmonton-Whitemud shortly. The Social Credit Party will not run candidates in any of the by-elections. TROUBLED WATERS – CBC reports that the Auditor General Merwan Saher found that sole-source contracts of up to $274,000 were awarded to Navigtor Ltd. during the 2013 southern Alberta floods. The firm has close connections to Mr. Prentice and former Premier Alison Redford. FLOOR CROSSING? – Rumours are stirring in political circles this week that Mr. Prentice and PC Caucus Whip George VanderBurg have reached out to a handful of Wildrose MLAs in an attempt to convince them to cross the floor. Any opposition floor crossings could be seen as a significant political win for the long-governing PC Party. This entry was posted in Alberta Politics and tagged Alison Redford, Calgary-Elbow by-election, Calgary-Foothills by-election, Calgary-West by-election, Donna Wilson, Edmonton-Whitemud by-election, Emma May, Fred Horne, George VanderBurg, Gordon Dirks, Greg Clark, Jim Prentice, John Fletcher, Kathy Macdonald, McDougall Centre, Merwan Saher, Pharmacare, Rona Ambrose, Sheila Taylor, Stephen Mandel, Susan Wright on October 2, 2014 by Dave Cournoyer. 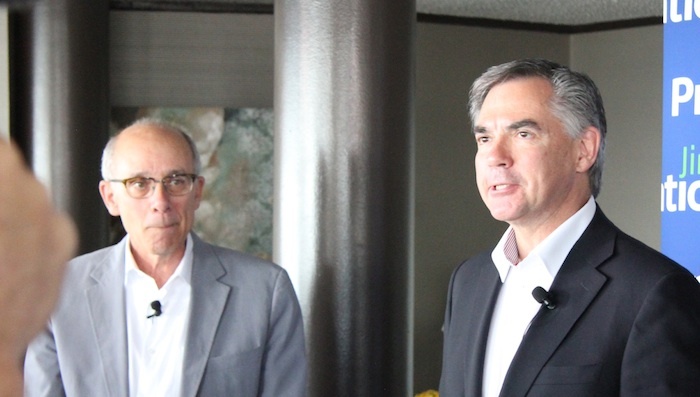 Former Edmonton mayor Stephen Mandel and Jim Prentice on June 10, 2014. Albertans in four provincial constituencies will go to the polls on October 27, 2014. Half-way through the PC Government’s current four year term in office, the by-elections will be our own version of the mid-term elections. Yesterday morning three anticipated provincial by-elections turned into four when first-term Ken Hughes announced his resignation as the Progressive Conservative MLA for Calgary-West. Earlier in the morning, Independent MLA Len Webber, fresh from securing the federal Conservative nomination in Calgary-Confederation, declared that he would vacate his Calgary-Foothills seat. Combined with vacancies in Calgary-Elbow and Edmonton-Whitemud, Alberta’s political parties will face off in four constituencies in 28 days. Premier Jim Prentice wants these by-elections to be a referendum on the past two weeks, during which time he has made daily announcements trying to undo unpopular decisions made by the Alison Redford-led PC Government. The opposition wants to make sure these by-elections are a referendum on the past two years of broken promises and misdeeds by the PC Government. Despite the unpopularity of the PC Party in recent polls, the four by-elections are not taking place in constituencies that were decided by small margins of victory in the last election. These four are some of the stronger PC-voting constituencies in Alberta. In the 2012 election, the PCs earned 60.4% in Edmonton-Whitemud, 58% in Calgary-Elbow, 53.5% in Calgary-Foothills and 49.9% in Calgary-West. After 43-years in power, will Albertans buy Mr. Prentice’s argument that the PC Party is “under new management” and has entered “a new era?” The PC Party prides itself with the ability to rebrand itself under pressure. Long-time Tories boast of the “Miracle on the Prairies,” the tale of Ralph Klein’s reinvention of the PC Party before its expected defeat in the 1993 election. But fresh in the minds of many Albertans is the hope and opportunity that seemed real when Ms. Redford became Premier in 2011. We were promised a new era reminiscent of the days when Peter Lougheed led our province. Instead, we received two years of arrogance, broken promises, budget cuts and endless political spending scandals. And despite attempts to blame it all on Ms. Redford, it is hard to forget the 60 PC MLAs who stood behind her during those two years. The appointment of two cabinet ministers from outside of the Legislature certainly helps the argument that the PC Government is “under new management.” But however credible the two men are, and despite their records as successful politicians, their age and notable careers in politics certainly undermines the argument that we have entered “a new era” in Alberta politics (Gordon Dirks is 67-years old and Stephen Mandel is 69-years old). The four PC candidates in these by-elections could easily all be elected, but some of them could just as easily be defeated. By-elections are risky for incumbent parties because they give voters an opportunity to voice their disapproval without changing a government. Running in Calgary-Foothills, Mr. Prentice will soon face voters for the first time since he was selected as PC Party leader on September 6, 2014. Wildrose leader Danielle Smith is expected to announce her party’s challenger in Foothills today. The lack of interest in the recent PC Party leadership race suggests that many Albertans have put our Natural Governing Party on probation. It will be a test of Mr. Prentice, Mr. Dirks, Mr. Mandel and Calgary-West candidate Mike Ellis, to prove themselves worthy. And it will be a test of the opposition parties to remind Albertans why the PCs do not deserve another chance. For an updated list of by-election candidates, visit the Alberta Election 2016 page. This entry was posted in Alberta Politics and tagged Alberta by-elections, Alison Redford, Bob Turner, Brian Malkinson, Broken Promises, Calgary-Confederation, Calgary-Elbow by-election, Calgary-Foothills by-election, Calgary-West by-election, Danielle Smith, De-Redfordization, Edmonton-Whitemud by-election, Gordon Dirks, Jennifer Burgess, Jim Prentice, Ken Hughes, Len Webber, Michelle Glavine, Mid-term elections, Mike Ellis, Peter Lougheed, Polly Knowlton Cockett, Ralph Klein, Stephen Mandel, Tim Grover, Troy Millington, William Munsey on September 30, 2014 by Dave Cournoyer.